After years of trial and error, I finally came up with the perfect succulent potting mix recipe. This is the best soil for succulents, and it’s super easy to make too! 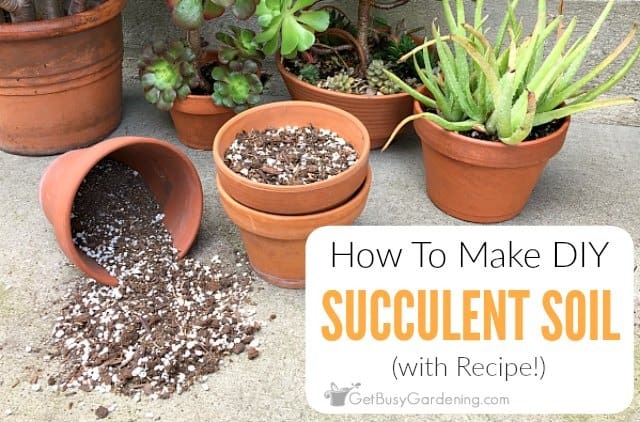 In this post, I will share my recipe and show you exactly how to make your own succulent soil. I don’t buy succulent soil, I make my own. It’s much cheaper than buying a commercial cactus and succulent potting mix. Plus, I think the commercial soil mix for succulents and cacti (at least the stuff I’ve purchased in the past) are light on sand, and hold more water than I like. Making your own succulent soil is not only cheaper than buying the commercial stuff, it’s super easy. Choosing the right potting soil for planting succulents in containers is crucial! When readers reach out to me about problems with succulents, most of the issues they have are caused by overwatering. Overwatering is the number one cause of death for succulent plants, and that is why it is super important to make sure you use the right type of soil to plant succulents. The best potting soil for succulents is a well draining potting mix. Using a good potting mix of porous soil for succulents is super important to prevent overwatering. The main benefits of making your own DIY succulent soil mix are that it’s cheaper, and you control the ingredients. Making your own bulk potting soil mix is cheaper than buying a pre-made commercial succulent soil. 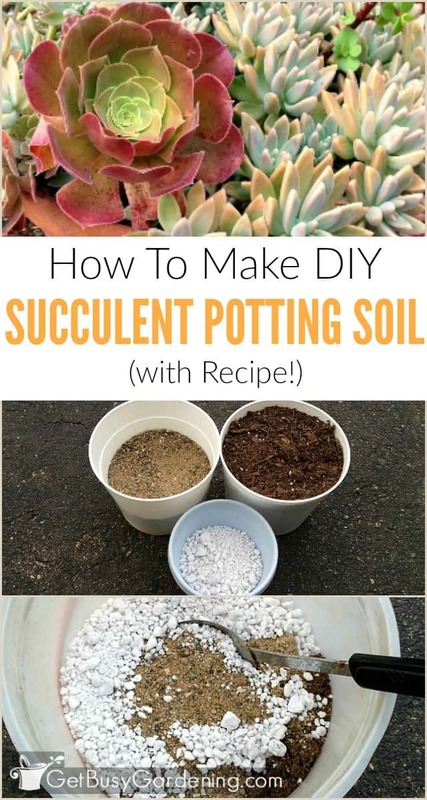 Plus, since you control the ingredients, you can modify this succulent soil recipe to get the perfect soil mix that your succulents will love. Like I said, I find that many commercial succulent soil mixes aren’t coarse enough for my liking. So, over the years I’ve played around with making my own succulent mix, until I figured out an easy, inexpensive recipe that I love the best. I wanted to make sure the ingredients were all easy to find in your local garden center, or online. Plus, I use these ingredients to make my other homemade potting soils too, so they are all very reusable. Any type of all purpose potting soil for indoor plants will work as the base to make your own succulent soil. Use whatever you have on hand (as long as it’s fresh, sterile potting soil). The brands of potting soil I use varies depending on what’s on sale at the time I need to buy potting soil. When making potting mix for succulents, it’s best to use a light, porous soil as your base. Don’t use heavy garden soils, and don’t use potting mixes that contain vermiculite, or any type of moisture control potting mix that says it retains water longer than other mixes. Succulents need a well draining potting soil, not one that holds moisture. Succulents grow best in a porous sandy potting soil, so amending your potting soil with sand is super important. The type of sand I buy is just the stuff they sell for use in a sandbox (I buy it at either Home Depot or Lowes). You could use any type of sand, but to ensure fast drainage for succulents, I recommend buying a coarse sand rather than the really fine stuff. Just don’t use sand from the garden, the beach, or a sandbox (you never know what nasties will be in that sand). If you prefer, you could use turface or poultry grit instead of sand. Either of those make excellent alternatives to sand in this recipe. Perlite is a very lightweight organic soil amendment. It’s the white pieces that look like Styrofoam that you see in many commercial potting mixes. Perlite retains very little moisture, prevents soil compaction, and helps add better drainage for succulents. In other words, it helps the soil drain faster which is exactly what we want for succulent potting soil. 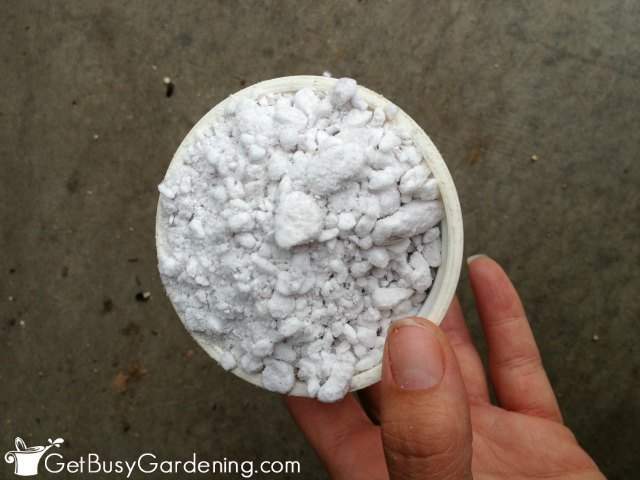 You can usually buy perlite or pumice at any garden center or home improvement store in the same section as you would find potting soil for sale, but sometimes it’s hard to find in stores, so I usually buy it online. * My recipe for DIY cactus soil mix is very similar, and it’s easy to modify this recipe to make potting soil for cactus plants instead. To make the perfect cactus potting soil mix, I add about 1/2 – 1 part more sand and perlite in my succulent potting soil for extra drainage. What is a “part”? – A “part” is just a generic unit of measure to use for your potting soil mix ratio. You can use anything you want to measure your ingredients, as long as you use the same type of measure for each “part”. If you use a scoop measure for 1 part, then use the same scoop twice for 2 parts, and three times for 3 parts. So, for example if you use a 1 cup measure, then this potting mix recipe would convert to 3 cups potting soil, 2 cups sand, and 1 cup perlite. Mixing your DIY potting soil for succulents is super easy. All you need to do is dump everything into your mixing container (bucket, potting tray, wheelbarrow… whatever) and stir it all together. Use a trowel, or your hands to mix it. Just make sure the ingredients are evenly mixed once you’re done. That’s it. Told you it was easy to make your own potting soil for succulents. One of the things I love the most about making my own DIY succulent potting soil is that I can mix up a big batch, and store the leftovers for later. Succulent soil can be stored on a shelf in your basement, garage or garden shed. 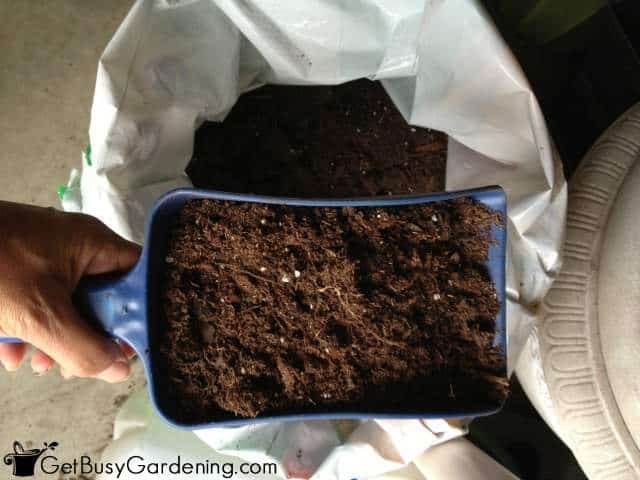 You could mix a bunch of homemade potting soil ahead of time and store it for later use, or just mix it as you need it. I like to mix up a big batch, and then I store it in a plastic bucket in the garage so I always have succulent soil on hand when I need it. Make sure to store your succulent potting soil in an air-tight container. You don’t want pesky bugs getting in there. If you don’t have an air-tight container you can use, I recommend you buy one of these bucket sealing lids, which work with a five gallon bucket. 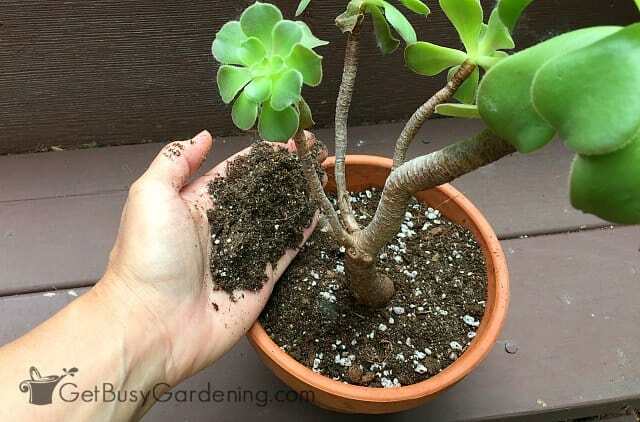 This DIY succulent potting soil can also be used for propagating succulent cuttings. My succulents (and cactus plants) grow very well in my homemade potting mix for succulents, and making my own saves me tons of money (It seems like I’m always potting succulents and cactus plants!). If you want more information about growing and caring for succulents, read my detailed succulent plant care guide. It has everything you need to know about growing succulents, including watering, light, fertilizing, pruning, pest control, propagation, and even a list of some of the easiest succulents to grow! Do you make your own succulent soil? Share your succulent potting soil mix recipe in the comments section below. Very good advice. I just repotted a bunch of succulents this weekend and I just use a imprecise +/- 1/2 sand, 1/2 potting soil (with perlite). It's one of the reasons I love succulents, as long as the soil drains well, they'll be fine. I love succulents too! They are so easy to care for and propagate. Dear Amy. Good advice about the succulent potting soil. One tiny detail you never use the play sand that is meant for sand boxes.1. It has been sterilized.2.Too small particles. It will clump together. So the deal is use big grained sand. Bank sand we call it in Houston. For potting soil and garden soil also.I use to run a plant nursery. It is way cheaper to make your own. Where did you find bank sand. I was only able to find play sand. I move my succulent plants indoors and grow them as houseplants during the winter here in MN. 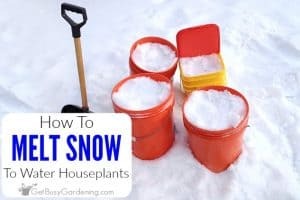 But, if you’re in a warmer climate and only need to protect them from short cold spells, then you can just move them into a porch or garage overnight (or even up to a few days if the cold spell will last a few days). 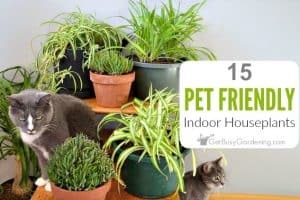 But, if you’re in a colder climate like me, then you’ll need to bring them indoors for the winter. Here’s a detailed post about how to care for succulents indoors… Succulent Plant Care. lol wish I had read this before I went out and bought 8 different succulents and made up a batch of “soil”… I used play sand… did I just kill all the babies I just bought ? If the sand you used wasn’t coarse, then you may want to amend the soil in your containers with more coarse sand. But if you make sure to allow the soil to dry out completely between waterings, your succulents should grow just fine. Hello!! I read your post and it was very helpfull..I used to use vermiculite when i lived in Portugal (very dry weather) now I'm living in Ireland (very humid, wet) and I'm still using, for the first time i lost a succulent with root rotten..Now I know why. Thank you very much.!! This is great Sheila! Thanks for sharing this, it's really fun to see my post translated in Portuguese! You wash your succulents? How, is this something I should be doing? I”m getting ready to repot several that have been in same pots for several years and are not doing well now, they live on screened in porch in mostly sunny warm south central FL. Should I try to “wash” them? Debugging and Cleaning Potted Plants You don’t need to wash them if you haven’t had any issues with bugs. Our winters are much, much longer than yours and houseplant pests are a major problem. How do you wash your succulents? I have some succulent/cactus mix soil from the store, which I guess has sand already mixed in. Would mixing this soil with some pebbles or gravel have the same effect as the perlite, since the goal is to prevent compacting? For sure you could do that. The only thing is that pebbles or gravel will add weight to the pot, where perlite will not. It depends on the size of your pot. It wouldn’t be a big deal for small pots, but if you have a large pot, it will get very heavy. is that by weight or volume? thank you! I live in New Mexico – I leave my succulents and cactus outdoors all year long. When we have very cold/freezing weather, (and we DO have sub-zero temps occasionally) I invert a plastic pot with holes drilled in the bottom, over my succulents at night and uncover them during the day. Has worked for several years, even through the weeks of sub-zero weather in 2011. Our biggest problem down here in winter is wind-chill. Sounds like a great, easy way to protect your plants. Thanks for sharing your tips! Awesome, thanks for sharing your recipe! I’m new to the succulent world. Always had a green thumb. But I thought I could just buy them, replant them in cute containers in potting soil. It worked for awhile. After about a month all of them started to either and the leaves started taking off. You really have to read and know how to care for them. Trying to save them all. I think they’ll be OK. Sorry to hear your succulents are suffering! 🙁 Good luck bringing them back to health, I hope they will all survive for you! I am definitely going to try your recipe for succulent soil. I have been using palm and cactus mix and not having good results with my semps. I always get confused when people say 1 part this and 2 parts that. Does one 1 part equal 1 scoop or handful? I really want to get this correct. You can use anything you want, as long as you use the same type of measure for each “part”. So, if you use a scoop measure for 1 part, then use the same scoop twice for 2 parts. Does that make sense? So, for example if you use a 1 cup measure, then this recipe would convert to 3 cups potting soil, 2 cups sand and 1 cup perlite. 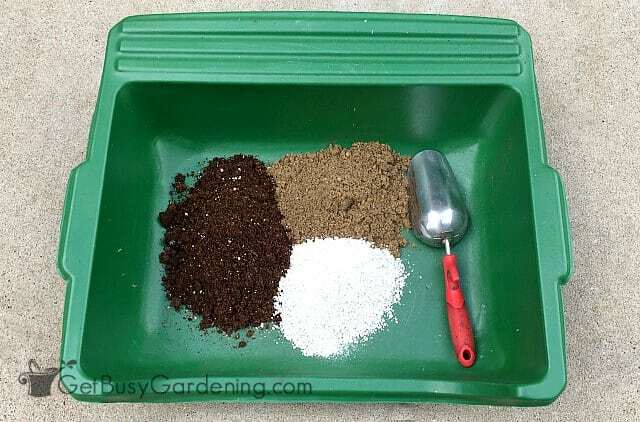 If you use a scoop, it would be 3 scoops potting soil, 2 scoops sand and 1 scoop perlite. 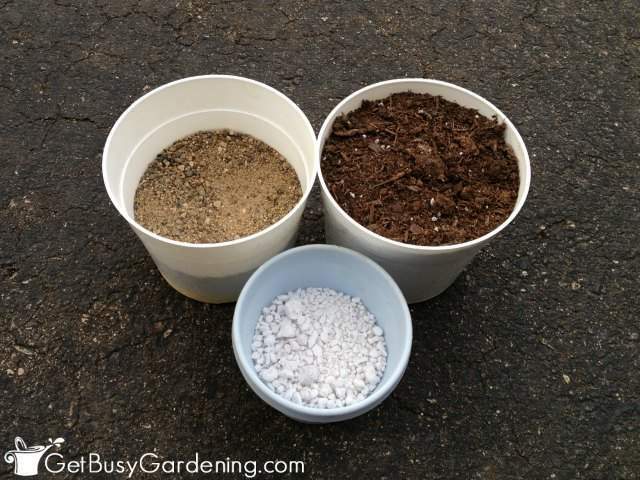 A handful would be 3 handfuls potting soil, 2 handfuls sand and 1 handful perlite. My indoor jade plant leaves are falling pls. suggest the maintenance and also the causes of this . I bought it just two days back. Could you describe the problem you’re having with the plants? I’m guessing that if you just bought them, then they were already struggling before you even brought them home. Read my detailed jade plant care guide to help you out. 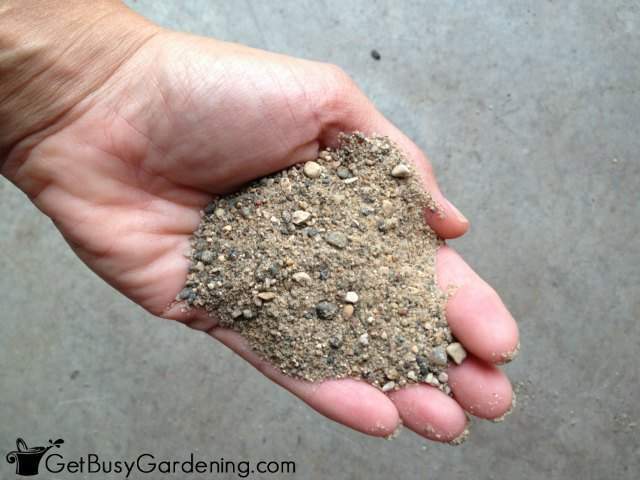 Pumice is used in quality potting mixes. Perlite contains nothing relative to plants diet, completely inert. Great, thanks for the suggestion. 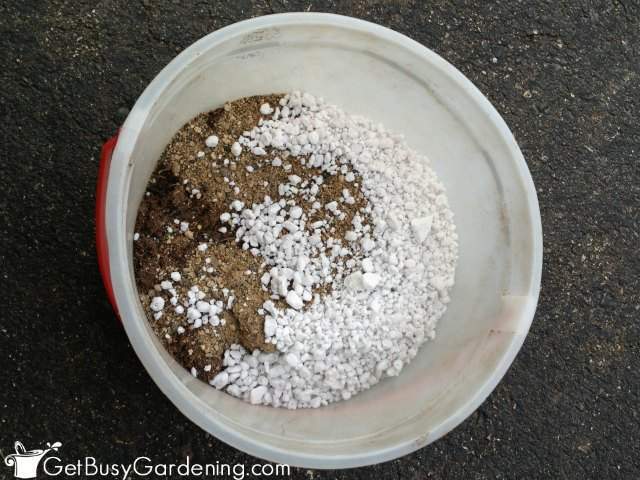 Yes, perlite is purely added to help with drainage. Are you sure it should be the kind used in sandboxes? I bought that and it seems really water-retaining. How long should it take for the surface of the soil to dry in this mixture? It should be porous sand, not the fine stuff. It shouldn’t take more than a week or so for the surface to start to dry out, depending on how saturated it was. If it’s holding too much water, then I would add more perlite or find a more porous sand. Also, don’t water the plant as often. My question is I started succulents a few months ago ,I have a fish tank with the ultra violet light, at first they to seemed to be doing just fine and then the leaves starting falling off. What did I do wrong ? Oh not all suffered the leaf loss, I also spray them lightly ,misty is that ok for them ? Making a succulent section surrounded by rock. Got rid of grass. We put plastic sheeting on ground before rock. My question is: can I plant on sheeting to help keep weed from growing or do I need to cut sheeting and plant on soil. You’ll definitely need to cut the sheeting and plant them in the soil. You can use layers of newspaper. Roots will go through it, but grass will not. Once your plants have established themselves they’ll pretty much crowd out grass. The newspaper will degrade into the soil. thansk kathy for the information…hope the dyes used in newspaper for printing wont harm the soil and the plants as have read these synthetic dyes contain metals and poisinous metals like mercury and lead.please advise. Thanks for the great tips for growing succulents in the ground Nick! Thank you for the post. Im making over 100 succulent mason jar terrariums and started tge propagation last night. Its for a friends wedding who is on a tight budget and soil was going to be our main expense but no longer with your recipe. I already have the sand so a bag of soil and perlite and we will be set. Awesome, so glad I could help! I did the same thing for my wedding! Propagated a bunch of my plants into 4″ pots and grouped them on each of the tables as the centerpieces, and they were also the gift for people to take home. People LOVED them, and I still have friends giving me updates on how their plants are doing (almost 7 years later!!). Love it, what a wonderful idea for a wedding on a budget!! ok i’m ready to cry.. i thought how hard can it be to grow a cactus or hen n chick when i can grow roses iris’s and such … this is all starting to seem like alot more work than i imagined.. I just bought a blue candle cactus and I’m wondering what will be the soil to use when I repot it. You could use this recipe, and add a little extra perlite for extra drainage. 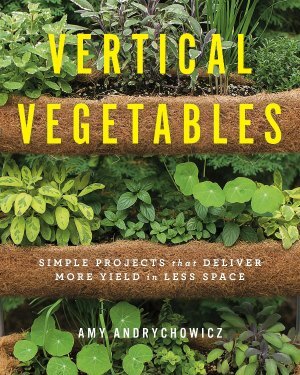 Hello Amy , how do i mixes the 3 ingredients in planting my vegetables . is it the same ratio of 3/2/1,thanks. No, I would only recommend this mixture for cactus and succulent plants. For potted vegetable plants I use a mix of potting soil and compost, about 1/2 and 1/2. If you’re growing them indoors, then I would say just use regular potting soil. What do you suggest for pots with no drainage holes? I always use pots with drainage holes for my succulents. Otherwise, if I have a decorative pot that doesn’t have holes, I will plant the succulent in a pot that has drainage holes, and then just drop the pot into a decorative one that doesn’t have holes (like this). That way, I can pull the plant out to water it, let the water drain out the bottom, then put it back in the decorative pot. Definitely use pots with drainage holes if you put your plants outside though. You say to always use plant with drainage holes but tgen talk about mason jar tereriums (sp?) How would this work? I aldo see succulants in all kinds of containers how does this work regarding draining? Growing succulents in pots without holes or in mason jar terrariums is definitely more difficult because it would be really easy to overwater them. But if the soil is kept dry enough, then it’s definitely possible. I always recommend using pots with drainage holes for beginners. But some people have no problem growing succulents in pots that don’t have any holes. A common problem I always had was getting soil wet again if it completely dries out. Water would find its way past soil and drain out, leaving behind mostly dry soil. I fixed that by mixing in cheap clay based cat litter. But as little as possible since the cat litter can clog up loose soil. If it’s draining too much, then don’t add as much sand and perlite to the mix. But keep in mind that for succulents, you want the soil to dry out between waterings. I used your recipe to make my first succulent potting mix, with rocks in the bottom of the standard plastic pots to aid drainage. 2 days since any rain, around 20C in a relatively exposed spot, and my moisture meter is still reading moist-to-wet in the soil, so drainage is obviously not working too well with this mix. I don’t know why you are having good results and I’m not? I used coarse sand, medium-to-large perlite, and regular composted pine bark potting mix with no water crystals or vermiculite. Does your pot having drainage holes? If not, that is the problem. I recommend using a pot with drainage holes for all pots outside, or any that are used for potting succulents. You could use styrofoam as an alternative to perlite, but it’s not compostable. You could also use small pebbles, but those would add more weight than perlite. I’ve never heard of using rice hulls, so I’m not sure about that. Sounds like you’re doing all the right things. Just be sure not to overwater them. You want the soil to dry out completely between waterings. I’ve never had a problem with my succulents being overwatered by rain when they’re outside. But if you live in a really rainy and humid climate, then you may want to move them to a location where they’re better protected from the rain. Also, make sure they aren’t sitting in trays where water can pool. And, if you don’t already, you can grow your succulents in terracotta clay pots. Growing succulents in unglazed clay pots helps to dry the soil out much faster than plastic one. Regarding where to get perlite if you can’t find any in your location. Try Amazon.com if you haven’t already. They have raised the minimum order to $50 to get free shipping I find it’s not hard to make the minimum, I keep an Amazon list and order when I need other stuff. I was wondering is this succulent mix good for growing a rhipsalis too?.. Just curious, what’s wrong with vermiculite? Great question Brenda! Vermiculite retains water, and you don’t want that for succulents. Succulent soil mixes should be fast draining, and not hold on to moisture. 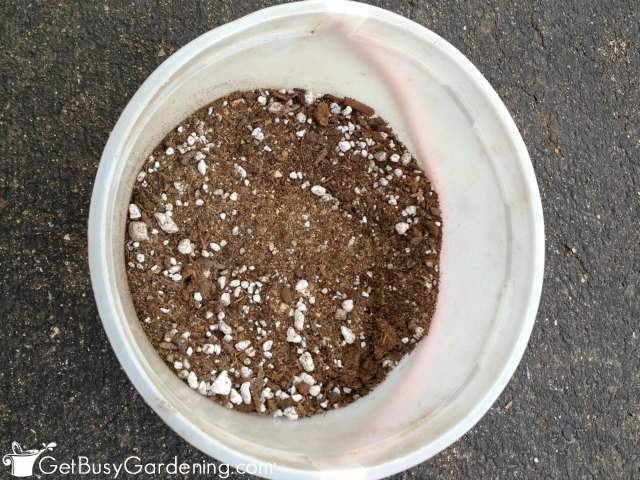 Vermiculite is great to use in potting soil mixes for plants that don’t like their soil to dry out, and it’s also great for using in soil mixes to start seeds (here’s my seed starting mix recipe) and for plant propagation. You mentioned that you could use any soil for this mixture and ratio. I already have the succulent/cactus soil that I brought from the store… I’m wondering, could I use this premade succulent/cactus mix along with the course sand and perlite? Or would I have to use a different ratio if I already have this soil mix? Yes, you can use the soil you already have. If your succulent potting soil is already coarse, then you shouldn’t need to add anything else into it. Depending on the brand of succulent soil you bought, you may find that you need to add more perlite/sand to it. If the soil looks more like regular potting soil, then you could add a bit more perlite/sand to the mix to make it more coarse. Hello, I simply LOVE your blogs about succulents, as I have recently began collecting succulents & trading out cuttings with my boyfriend’s mom. Being almost 40 yrs old, I’ve never really been able to successfully grow ANYTHING, let alone propagate. When I moved from mew Orleans Louisiana,back to the Mohave dessert of Indian wells valley california to live with my boyfriend, he introduced me to succulents. I instantly fell immediately in love. As with any passion, having researched succulents online, I learned that mostly all of my potted succulent cuttings are not planted in correct soil. Having read your blog, I am pretty certain that I have everything required for making succulent soil. I do have some lightweight, organic potting soil, and all I need to do is literally walk outside to my driveway & scoop up plenty of coarse sand from the dessert. And finally, to my question. I have lots and lots and LOTS of dark reddish colored lava rocks all over my yard, of which the previous occupants used in their landscaping plan. Now, when I take a hammer to those lava rocks, it is very easy to bust them down to approximately marble sized with little to no real effort. Would crushed up lava rocks work instead of pumice in your succulent recipe? I’m DYING to repot these, but I don’t want to make any moves until I get some confirmation. I’ve searched the internet, and so far haven’t really seen anything for or against crushed up red lava rocks….? I’d just, love your opinion. THANKS IN ADVANCE! Thanks so much! I’m so happy to hear that you love all the posts, and that you’re addicted to succulents now! Aren’t they fun!? 🙂 I have never used rock in my potting soil before, so I can’t say if it would work or not. Sorry! hello! thank you for the helpful tips on making our own soil mixture for succulents. however, perlite and pumice are hard to find,will it be alright to use aquarium gravel? i washed it about 15x before i mixed it with the soil/sand. 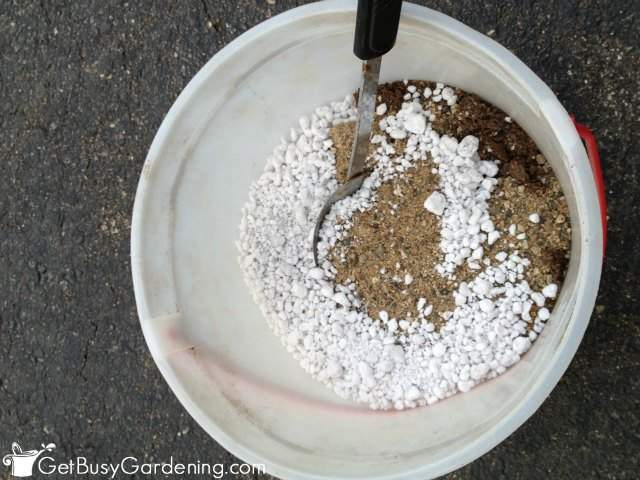 Perlite and pumice are located in the same area as the potting soil at any garden center or big box store, but they may not carry both. I also have links above to where you can buy them online. I have never tried using aquarium gravel in my succulent soil mix, so I can’t say how well that would work. It will definitely add more weight to your containers than perlite or pumice would though, so keep that in mind. If the leaves on your succulents are getting sunburn, that means they haven’t been hardened properly. They can be very sensitive to sunburn if they aren’t used to growing in the sun, and need to be moved to a full sun location slowly over time to avoid sunburn. If your succulent soil isn’t drying out fast enough, then yes I would mix up a new batch of soil and repot them again. If you’re buying potting soil to create the mix in my recipe, then you can just get a general purpose potting soil w/o any moisture retention (like you mentioned). But, if you just want to buy soil to use without mixing your own, then buy something that’s specifically says it’s made for growing succulents and/or cactus plants. The succulents I bought six pcs all died. I don’t know where to buy these perlite and pumice. I can’t find it here in North Finland. I need to propagate succulents for my terrarium but I can’t even survive them. I would recommend checking with a local garden center and see what they recommend using as an alternative to perlite/pumice if you can’t buy either of those where you live. Also, I wouldn’t recommend using succulents to grow in a terrarium. Succulent plants grow their best in a dry environment, and terrariums are built to hold in lots of humidity and moisture. An environment which can quickly kill succulents. hi!thanks for sharing your soil mixture. could broken corals be used instead of perlite/ pumice?. both are hard to find here in the Philippines. how long should the corals be sterilized before using them? i see plenty of broken corals along the shore and thought it would make a good combination with the soil. thank you. I’m not sure, because I’ve never tried it. The concern I would have it that the coral would have a lot of salt in it, which would be bad for your succulents. I’m not sure if you could somehow flush that out. Hi amy..thanks for the post…just started with succulents.as u mentioned only soil perlite and sand n have excluded compost. how r the succulents going to get nutrients.do u recommend ferlilizers.please advise. Thank you for sharing your thoughts for Cactus or succulent soil. I have done a great damage to all my succulent plants by over watering and due to bad conditioned soil. When you say you used “sea sand”, do you mean sand from the beach? If so, that is probably the issue since it would have a high quantity of salt in it, and salt is very bad for plants. I definitely recommend buying the succulent soil ingredients, rather than using anything from the beach or the ground. Awesome, so glad you found the succulent soil information you were looking for! Good luck with your succulents. I’ve been having a really hard time finding coarse sand. I ran across a brand called akasha natural coarse sand but it looks like it’s only rocks but it says coarse sand. Would that work for my cactuses? I’m not familiar with that product, but I looked it up and it looks like it would work to add drainage… but I’m not sure how large the pebbles are. If you can’t find coarse sand, turface or poultry grit also work great as replacements. Love your site! My question is that I have a friend who offered me colored sand that was used in sand art bottles. Would that work for rooting or should I say thank you and politely decline? Humm… I’m thinking the granules in the sand you’re talking about would be way too small to use. You want to use coarse sand in your succulent potting soil. Also, if it’s dyed, who knows what types of chemicals they used in the dye. If it was me, I would politely decline. 🙂 Although, it might make a pretty decorative soil cover, if you’re not worried about the chemical in the dye. Is it okay if I don’t add sand to the potting soil and just add perlite? I also add a layer of activated charcoal. Humm… I’m not sure because I haven’t tested that version of the succulent soil recipe myself. But one thing I can tell you is that growing succulents in terrariums can be very difficult. Succulents like dry conditions, so terrariums are usually too humid for them and they can rot pretty easily. I hear I could use succulent soil for African violets. Do you know if this is true? 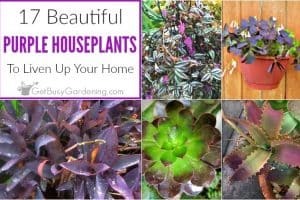 I wouldn’t use this mix for African violets, I created this recipe specifically for growing succulents and cactus plants. But if you tend to overwater your plants, then this mix would probably work just fine. African violets like a soil that retains more moisture than succulent soil, so it would be better to buy African violet potting soil, or use a recipe that’s specially made for African violets. i use 2cm of pebbles at the bottom of the pot than 3 parts compost 2 parts perlite. ive been doing this for 9 years and it works really well. Awesome, thanks for sharing your succulent soil recipe with us! Hi Amy, I rooted a succulent that was part of a Valentine’s arrangement 2 years ago and it is thriving ! However, it is outgrowing the container (in the house) and I need to re-pot it. At this time, it is growing 2 shoots with buds / blossoms on the ends. I had no idea a succulent would bloom so now I’m concerned about when to re-pot it. Any suggestions ? Also, I live in Wisconsin, just across the Mississippi from MN so not sure if weather conditions play a factor, but the plant is in the house. Appreciate your help ! Great! You’re welcome, hope your new succulents will grow well for you! hi amy….thanks for all the help and tips….regarding succulents… i am using egg shells(being economical) as perlite.and using dried leaves ratio to soil as 3:1 is that ok.
eggs shells information i found on the web. leaves recipe was conveyed by my local nursery and my gardener. * could u please provide me ur mail id so i can share some succulent pictures regarding some pest issues. You can share your photos on my Facebook page. 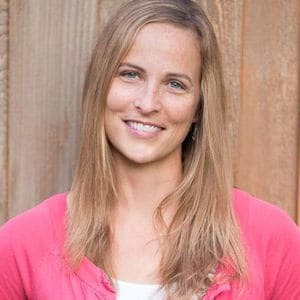 sure amy….what would u advise on egg shells as perlite and the leaves soil mixture..
Oops, sorry I missed that you were asking for advice about your mix. I would not advise substituting those ingredients for making succulent soil. I’ve never tried either of those ingredients in any of my soil mixes, so I can’t speak from experience. But I would think the leaves would hold too much moisture as they decompose, and the eggshells wouldn’t prevent soil compaction. If you have extra succulents then you can sure experiment with it to see if it works for you though. 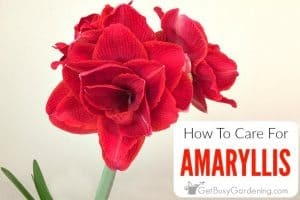 hi amy…hope u r in good health…recently i am seeing white webby spots on my succulents….black spots on a plant where the leaf seems to be melting from the inside(exactly same like when u put a fleshy fruit in the freezer and as u unfreeze the fruits fleshy seems to have melted). along with the leaf the stem seems to be rotting too…one of the plant recovered back on its own and i am seeing the same with 5 diffrent succulents…one of them has dried completely although i have sprayed all of them with a neem based insecticide.mixed with hand soap too.hope i am doing it correctly.can u please help..
Are your succulents infested with some kind of a bug? If not, then you don’t need to spray them with anything. It sounds to me like your succulents are being overwatered. Here’s my comprehensive guide for succulent plant care for more information on how to care for your succulents. thanks amy….no maam not being overwatered. it seems to be a bug as the leaves melts and the stem too melts and breaks off. (i can notice a number of black spots near the stem)the process can be seen on all leaves and and stem. one of the succulent was able to survive after being exposed to sun for 3-4 days along with a hebal insectiside spray. but the present one doesnt seem to be healing back. Whenever I’ve had problems with the stems rotting and the leaves dropping off like that, it’s been due to either overwatering or too much humidity. If your succulents aren’t in the sun, and you live somewhere humid and/or rainy, then that’s likely the issue. Succulents like a dry location, and most of them require lots of light/sun. But when you said there was white webbing, that makes me think of spider mites, so you could check for those. If you want, you can post a few photos on my Facebook page so I can take a look. amy one thing i wanted to add and confirm one of my succulent is loosing it leaves rit from the middle…today i noticed 2 small white non-hairy caterpillars. they were eating the leaves and have seen the same in other plants. was surprised as the succulents has been with me for more then 2 years but saw the caterpillar pest for the first time on it..
Ok, then maybe you’ve found the culprit. I would watch the caterpillars to see if they’re eating the leaves. If they are, then hand pick the ones you see, and continue treating the plants with neem oil. That will eventually get rid of the caterpillars. I have just started my small succulents and cacti collections. Yes, coco coir and peat moss would hold too much moisture for succulents. Have fun potting up your new babies! Thanks for the good advice. I was losing my succulents by using “cactus Mix” which as you explained does not have enough sand. I wasn’t watering too much – my soil was holding too much water. Thank you again! Yes, you can plant them in the dry succulent soil. If the soil of the succulents you’re repotting was already wet, then I wouldn’t water them right away. But, if they were already pretty dry, then I’d give them a good drink of water after repotting into the dry soil, then allow them to dry out completely before watering again. Can i just use 2 part potting soil and 2 part perlite? I do not have safe sand near me and in local shops. Very interesting reading. I live in South Australia where the climate is great for growing succulents. I have never seen turface or pumice for sale in any of our plant shops. i don’t like perlite because i reckon the white lumps do not look attractive. As far as sand goes, i have collected my own sand from the creek and used it in aquariums for years. This year I went to a sand and gravel merchant and bought ‘propagating ‘ sand, large amout for 5 Australian dollars. Pity your posts do not contain a date so I can see which ones are new or very old. 10 September 2018 i use a website called Pinterest for plant identification and ideas. Thanks for sharing your soil recipe. I just started planting succulent,since I have a greenhouse I decided to try planting it.i lived in Norhern California zone 8 so our winter is usually mild. I can’t click on the recommended items to see what the title actually is. I’m sorry, but I don’t understand your question. What are you trying to click on? Hi, I live in Zone 9b. San Jose, Ca. My area I want to plant is about 15 square ft. outside. How deep do I need to have the soil mix and is the recipe the same as the one you gave? This succulent soil recipe is for potted plants. For the garden, I would check your soil to see if it’s already sandy and fast draining. Since you live in CA, your soil might already be perfect for growing succulents. If your garden soil isn’t sandy, then I would amend it with coarse sand and perlite for your succulents. I’ve been using a somewhat similar method yet with 50% potting soil and 50% coarse sand. Recently, I’ve purchased a bag of perlite. I grow succulents, but the most notable ones are Aloes, Haworthias and Gasterias. Aloes are no big deal, but Haworthias and to some degree Gasterias have tendency for root rot, especially varieties of H. Truncata. They mostly do well, but I think my potting mix has to be improved somewhat. My question is whether it is a good idea to replace more of the potting soil with perlite, or do another change for that. My climate is Mediterranean. It rains a lot in winter. I can get high rainfall for days in a row, but frequency, intensity and time are unpredictable and the average is not very high. I have no frost in winter, which is good, considering the size of my collection and no sheltering space available. Yes, I would try mixing more perlite into your succulent potting mix. That will definitely help with drainage for your more sensitive succulents. i know its not the most organic stuff on the planet but woul crumbled Styrofoam do justice instead of perlite? Yes you’re right, it’s definitely not organic. But that aside, I still wouldn’t recommend replacing the perlite with styrofoam in your succulent soil. Styrofoam can become compacted over time, where perlite is hard and will not become compacted. This succulent soil is fast draining, so it won’t hold water for too long. 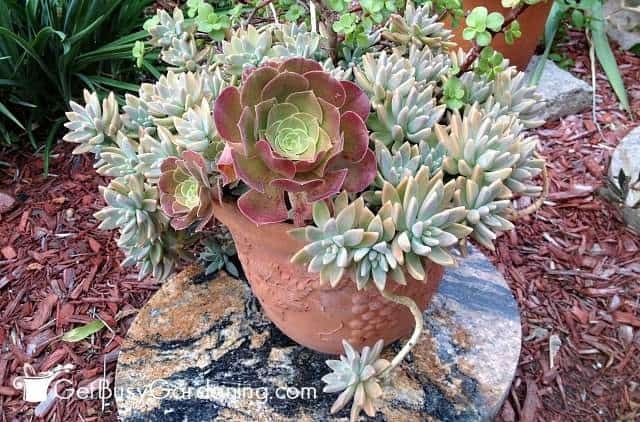 Occasional rain won’t saturate the soil, and will be perfect for your succulents. 🙂 Just be sure your pots have drainage holes.